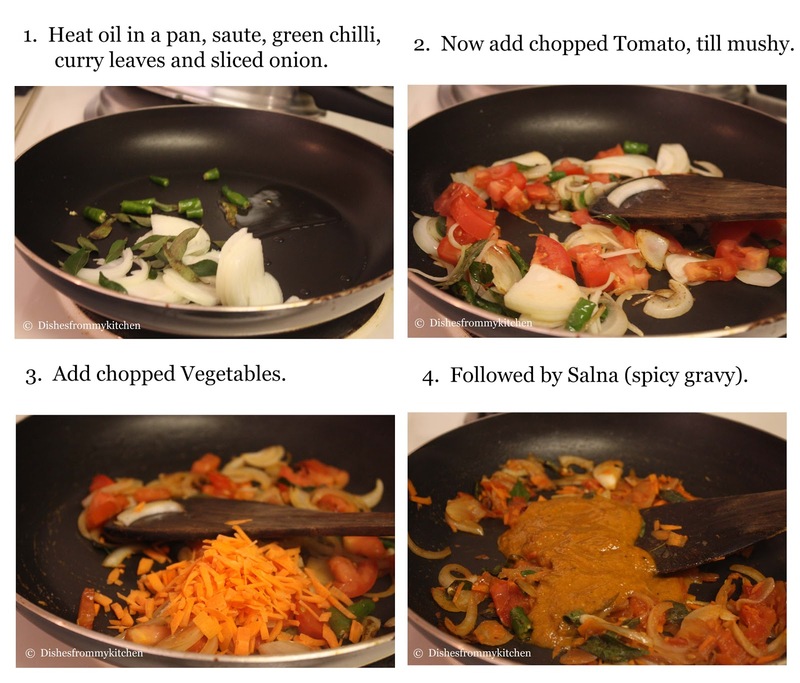 Dishesfrommykitchen: VEGETABLE KOTHU PAROTTA - DETAILED POST!!! My hometown is Madurai city in the state of Tamil Nadu which is in southern part of India. My hometown is called as a Temple city, which has a long history for its beautiful temples and architecture. This place is also called as "Thoonga Nagaram" (the city that NEVER sleeps) because it operates twenty four hours a day. A large number of city's food outlets remain open well past midnight and even you enjoy steaming hot food during the midnight. There are so many dishes that are famous in my town; particularly Parotta, Biryani, Idli and it is also well known for Non-vegetarian food. Parotta is a layered Indian bread made using all purpose flour, without any leavening agent and its almost everyone's favorite too. They are very famous in the southern part of Tamil Nadu, especially in Tuticorin, Viruthunagar and Madurai (My Home Town) where they serve it traditionally in a banana leaf. 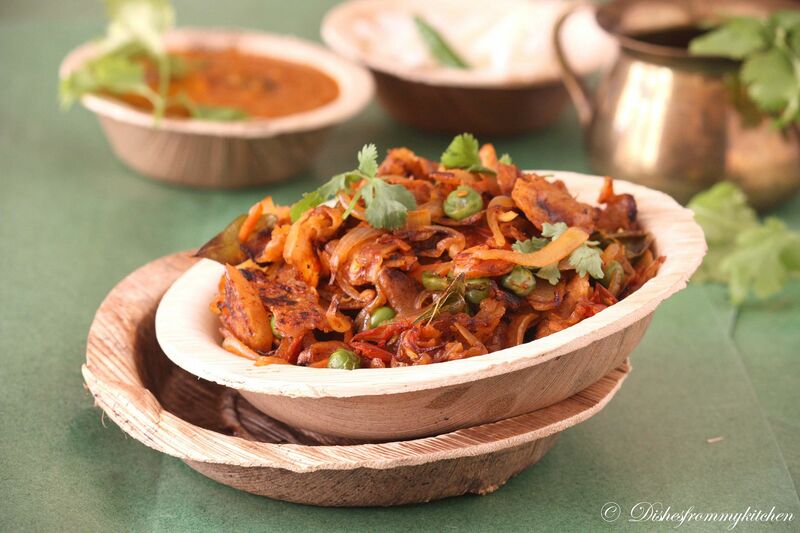 Kothu Parotta(Muttai) is a very famous road side food available in small road side food shops. It is also available in restaurants, but is usually tastes better in street food shops. 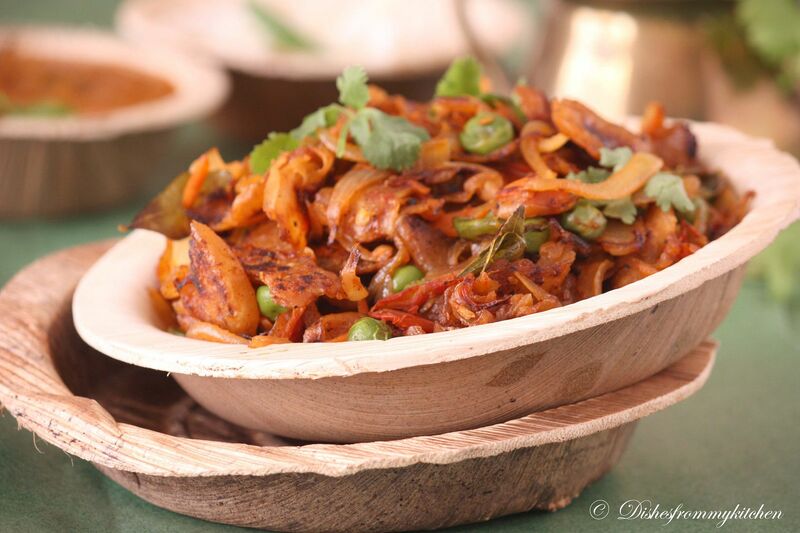 It is very popular in Tamil Nadu, but is also available in other parts of India and in Sri Lanka, where it is known as "Kothu Roti". Lets come to the recipe part: As I said earlier, in hotels they usually add Salna(basically a non veg curry, a spicy sauce) for making Kothu Parotta. But today I am giving you Vegetarian Salna recipe which you can make and add according to your preference. 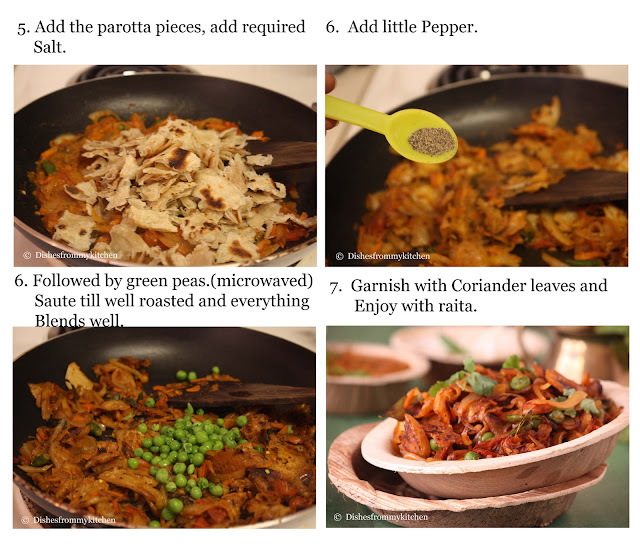 If you want to make Egg Kothu parotta, just omit the vegetable part and add egg that's it. Even if you are running out of time you can also make exactly same on without Salna but see note if you are doing in that way. 2. Add cummin seeds, fennel seeds, coriander seeds. 3. Saute the onions,tomatoes,ginger,garlic,grated coconut and poppy seed. 4. Once it is cooled. Grind to fine paste. 5. Heat enough oil, add the curry leaves,fennel seeds and whole spices. 6. Add the chilli powder and add the ground paste, little water. 7. Let it come to boil. 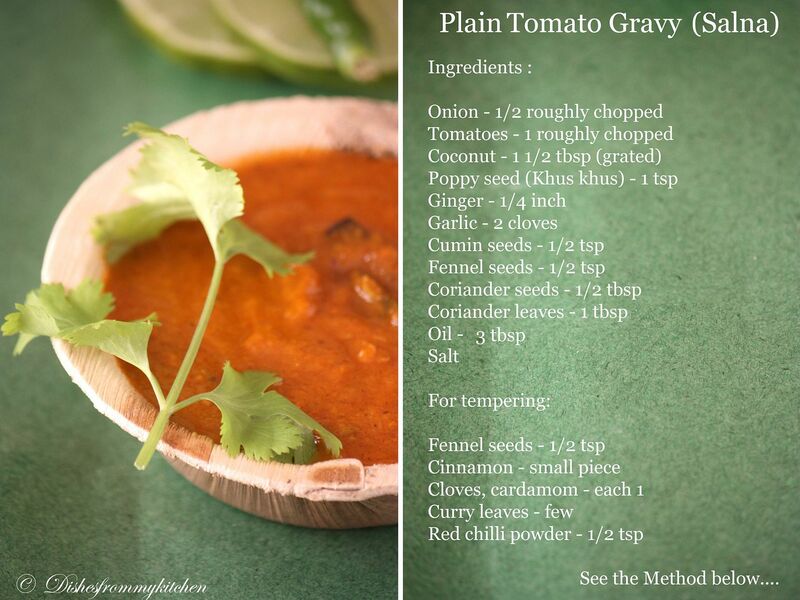 When the gravy thickens switch off the flame and garnish with chopped coriander. peas, so microwave for few seconds and keep it aside. 1. Heat Oil in the pan, add green chilli, curry leaves and onion. Saute till light brown and then add tomato. Add salt. Saute till it is mushy. 2. Now add finely chopped vegetables in this order first beans when it is half done, add carrots and cabbage. (I did not use beans and cabbage this time). 3. When the vegetables are sauteed well. Add the Salna (Gravy) and Parotta pieces. 4. Now add the pepper powder and microwaved green peas. 5. Saute well until everything is blended well and slightly roasted. 6. 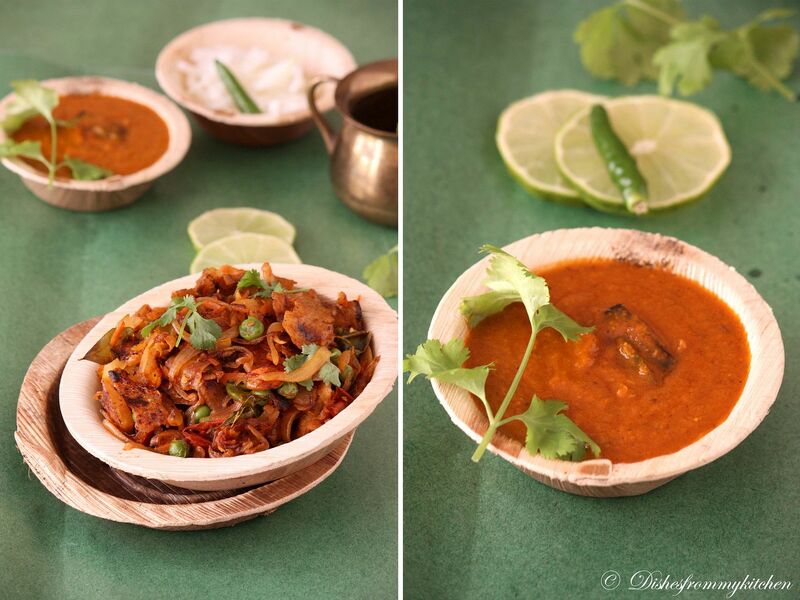 Garnish with chopped coriander leaves and serve hot with simply onion raita. 1. If you are making egg kothu parotta, just omit the vegetable part and add 4 eggs(break add little salt and beat seperately) after adding Salna and parotta pieces. Cook until everything is blended and roasted well. The egg gets scrambled , binds the masala and Parotta. 3. Add Salna according to your preference. The left over Salna can be used as side dish for chappathi, Dosa and Idli too. * Add tsp of Saunf(fennel seeds) for tempering. * Add tsp of Biriyani or egg masala while adding chilli powder. 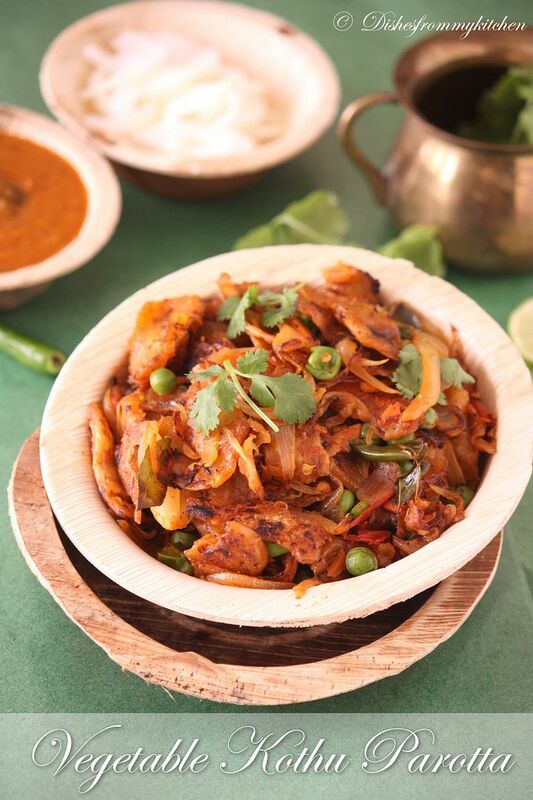 I LOVE kothu parotta and that looks awesome! Seriously you are killing me with ur clicks, cant take my eyes from that incredible kothu parotta Pavi. awesome recipe..thanks for sharing dear. OMG love this one. Amazing pics. super super delicious kottu parotta...can eat it anytime...very nice pictures and presentation :) love it.. The dish is too good.Love to try. Being from madurai side, I love kothu parotta too. Now I am missing here same like you. 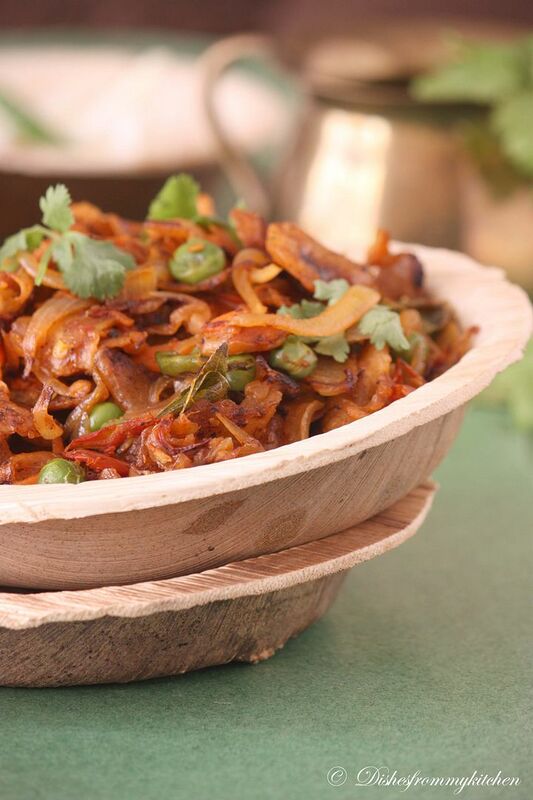 few months before when I saw frozen parotta in indian shop, oh...I pulled immediately and prepared kothu parotta. You post is making me drooooooool much and reminds me of my childhood. I love kotthu parotta and can eat it any time. Thanks for giving the veg version of salna. Had been searching for one to go with when I make at home. OMG! very inviting recipe...luv the clicks and presentation! Brings back memories. Looks so yummy dear! 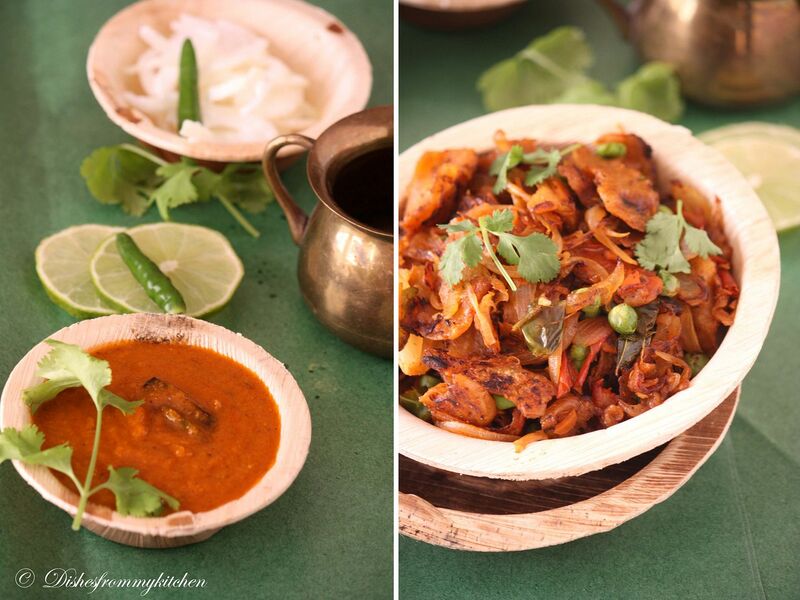 Love kothu parotta..thanks for sharing this..nice clicks..
awesome dish.. who would say no to kothu parotta..
OMG...pass me the bowl....kothu parota looks absolutely yummy. looks so yummy...very tempting and delicious !! Omg this is mouthwatering....beautiful photos, i was salivating while looking at this. Photos are great and done its job well....made me crave for this. I make it too, but slightly different method. I like your salna recipe which i want to try. That dish sounds amazing and looks ever so palatable! A fabulous combo. You make me miss our home state so much..:( I almost went back to TamilNadu street food stalls where this dish is served..
Oh my goodness, this is just fantastic! And the photos are gorgeous! Pavitra lovely read this was and what an pictorial dipict of the recipes. drooling over..
thank you for sharing the recipe. it came out well. My husband loves it! your pictures look wonderful!! YUM Pavi! Love Kothhu paratha. Sometimes I make with chappatis also :) Must try with this salna! awesome.I would love to try this. Also,can i have the receipe for the parotta. Thank you!